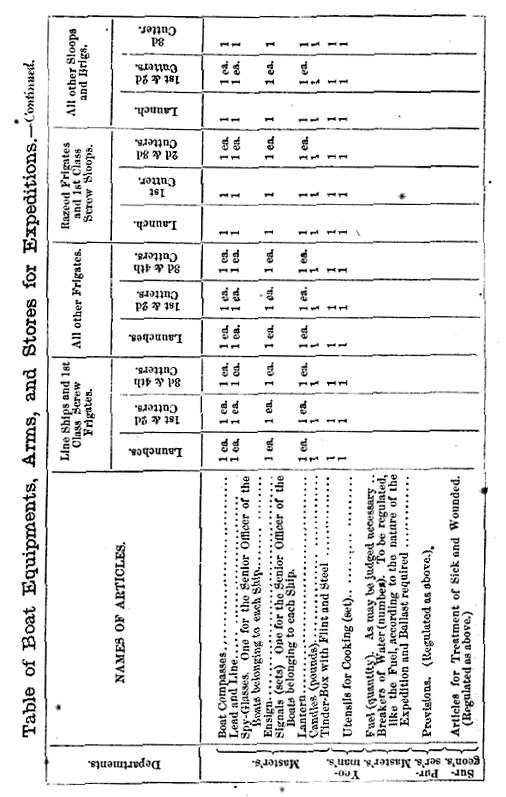 For boat stations and stations at the piece, when mounted on a “Field Carriage,” I have adopted Parker’s numbers, as they facilitate the forming of the men in two ranks. I would recommend all officers to study ” Dahlgren’s System of Armaments for Boats,” as I deem his instructions more complete and concise than can be obtained from any other source. This work has been arranged upon the theory that the fundamental principles guiding the service should be well understood by officers, before they are subjected to practical drilling. In preparing it, if anything has been done to promote the efficiency of Volunteer Officers in the discharge of their duties to the service they have entered, I shall feel myself fully repaid for the labor I have bestowed upon it. Instructor in Gunnery, U. S. Naval Station, New York. The Howitzer-Weight, Calibre, Chambers, etc., etc. What is a Naval Howitzer? It is the armament of the Launches and Cutters of the service. It is a light piece, capable of being used in boats. The 12-pounders are also used with field carriages. To whom are we indebted for the Howitzer? To Capt. Dahlgren, U. S. N.
Why was it adopted in the Navy? For want of a proper boat and field-piece for naval purposes. During the Mexican war, attention was first drawn to the importance of the Howitzer. A Board of Officers was appointed to investigate the subject, and Dahlgren’s Howitzer was the result. What are the advantages of the Howitzer? In covering landing parties when the water is too shoal to admit of an approach to the shore, excepting by boats; and against other boats and light-armed vessels which afford slight protection to the men. Three classes: The 24-pounder, medium 12-pounder, and light 12-pounder. * The answer to this question refers to the smooth bore Howitzer. Since the author commenced this work the rifled Howitzer has been introduced. and will be treated upon in a subsequent edition. Of what metal is the Howitzer made? Of an alloy of about 90 parts of copper and 10 of tin. Why is this metal preferred to iron for field-pieces? Because it has greater tenacity and strength; the pieces can be made lighter. What is the objection to this metal? The difficulty of forming a perfect alloy, owing to the difference of fusibility of tin and copper. What is the weight of the Howitzers respectively? 24-pounder, 1,300 lbs. ; medium 12-pounder, 750 lbs. ; and light 12-pounder, 430 lbs. What is the Boat Armament in the U. S. Navy? Launches—24-pounder, of 1,300 lbs., with a boat carriage. 1st and 2d Cutters—12-pounder, of 750 lbs., with boat and field-carriage. Launches—12-pounder, of 750 lbs., with a boat and field-carriage. 1st Cutter—12-pounder, of 430 lbs., with a boat carriage. Launch—12-pounder, of 750 lbs., with boat and field carriage. Launch—12-pounder, of 430 lbs., with a boat and field-carriage. How are the different Guns distinguished? By the weight of their projectiles and their calibers. What is meant by Caliber? The diameter of the bore. All the parts bored out, including the chamber. What is the diameter of the Bore of the 12 pounder Howitzer? What is the diameter of the Bore of the 24 pounder Howitzer? The aperture through which fire is communicated to the charge. Why should the Vent be small? Because the velocities of the gases arising from the combustion of powder being extremely great, a large amount escapes through the vent, therefore lessens the propelling force which acts on the projectile. What precautions are necessary to protect the Vent and Bore? ‘They should be kept closed, and frequently visited, to prevent an accumulation of foreign matter. The extremity of the bore ; the small part destined to receive the charge of powder. To lessen the recoil of light guns destined to throw heavy projectiles, it became necessary to reduce the charges of powder, and as the reduced charges occupy a small space, and, consequently, difficult to keep them in their proper places, the bottom of the bore was contracted in the form of a chamber. How many kinds of Chambers are there? Two: the cylindrical, and conical or Gomer chambers. What kind of Chamber has the Howitzer? A conical one, which is joined to the cylinder of the bore by a portion of a spherical surface; it is called the Gomer chamber. The difference between the diameter of the projectile and the diameter of the bore. What is the use of Windage? the bore of the gun, and to make an allowance for the piece becoming foul. What is the true Windage of the 24 and 12pounder Howitzer? What are the inconveniences of too great Windage? It diminishes the effect of the powder on the projectile, causing it to rebound too often, thereby injuring the bore; it also increases the inaccuracy of fire, as the projectile follows the direction influenced by the last rebound. Give an example of the loss of velocity by Windage. The ball of a 6-pounder field-piece, with a charge of 1.5, had an initial velocity, without windage, of 1,734 feet; with a windage of 1/40th diameter, an initial velocity of 1,560 feet, making a loss by windage of 174 feet, or 10 per cent. What is the loss of velocity by a given Windage? It is directly as the windage, and inversely as the diameter of the bore, very nearly. How many Carriages are used with the Howitzer? Two for the 12-pounder—field and boat-carriages; for the 24-pounder, only the boat-carriage. 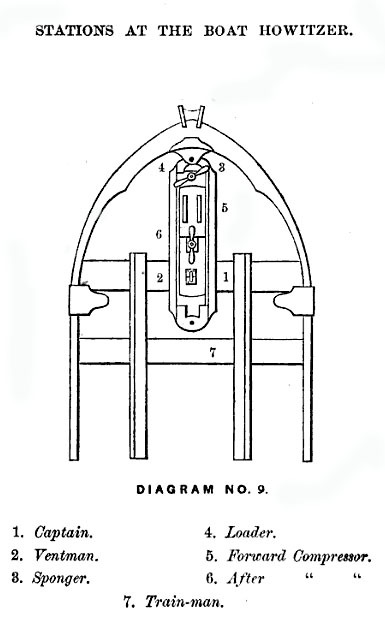 The boat-carriage ‘is composed of the bed, A, the slide upon which it moves, B, the -lugs, loop C, two compressors, screws, and bolt, D, a wooden plate beneath the slide, connected with the bed by two bolts. See diagram 1. It is composed of the trail, A, which has a small wheel or runner, B, to ease it over any obstacle, an axle, two braces, C, which branch from the trail to the axle, secured by nuts, two wheels, box of the elevating screw, D, and loop-lugs, E. See diagram 2. What are the Sights of a piece? Artificial marks on the piece for determining the line of fire. What is meant by pointing a piece? To give it the inclination and direction required for the projectile to strike the object: 1st, give the direction; 2d, the elevation. How would you aim to obtain this result? By the natural line of sight, or line of metal, which is made to pass through the eye and the object to be struck, if within point-blank range. How are the different Elevations obtained? By means of the breech-sight bar. What is the Breech-Sight Bar? It is an instrument which serves to increase, at will, the diameter of the breech, and which permits, by means of a muzzle-sight, a point-blank for every distance, and, consequently, to fire directly on the object to be struck. In using the Breech-Sight Bar of the Howitzer, how is the chief of the piece to be guided? By the graduation of the fuze to be used. How are the Breech-Sight Bars of the Howitzer graduated? For seconds, corresponding with the graduation of the fuzes: The sight-bar gives the elevation to the piece which is required to carry the projectile to the proper distance, while the fuze adjusts the explosion to the time which the projectile occupies in traversing the space ; therefore, the sight is graduated to the intervals of time which will carry the projectile to its required position, and each graduation is accompanied by the two distances, which include the spread of the Shrapnel balls. If it is desired to explode the Shrapnell about 500 yards from the piece, adjust the fuze to two second^ and elevate the piece by the sight raised to the line on it marked 2 seconds. The Shrapnel will spread its balls from that point effectively, at least 150 yards further. How is the Howitzer pointed in boats? First get the elevation, and then the direction. When the lateral training is only 3° or 4°, use a training rope to bring the piece to bear on the object; if more than 3° or 4°, you point by means of the helm, directing the boat toward the object. When the rolling of the boat interferes with the pointing of the piece, how is it lessened? The blades of the oars are inclined flat side down, on the water’s surface. When pointing, how is the fire of previous rounds corrected? By the foam of the jet of water caused by the ball thrown; or, if not discernible by the operator, the elevation and time of the fuze can be corrected by signal from the boats most remote. Can this correction of previous rounds be resorted to on land? It can hardly be relied on. What is meant by the extreme Range of a piece? The greatest horizontal distance to which its projectile can be thrown. The distance from the piece where the projectile finally rests. On what does the Range depend? On the weight of the charge, quality of the powder, windage of the projectile, and the angle of projection. Does an enlargement of the vent affect the Range of a piece? Yes, because the escape of gas through the vent weakens the force that projects the shot. Why does the angle of projection affect the Range? Because the trajectory being subject to the line of fire, rises and lowers with it, which increases or diminishes the curvature, and, therefore, the distance to which the projectile meets the horizon..
How do the diameter and weight of the projectile affect the Range? As the ball increases in size and density, it’ will overcome with more ease the resistance of their. What angle of projection gives the greatest Range? In theory, the range is greatest at an angle of 45°, and is the same for elevations equally above or below 45°. These conclusions are materially modified in practice by the resistance of the atmosphere, which not only changes the path, but the velocity of the projectile. About 36° elevation will^ probably, give the greatest range. What is the effective Range of Howitzers? From 1.200 to 1.300 yards. Trajectory and Lines of Sight, etc. The line or path the projectile describes in reaching its destination: it is a curved line. What is the line of metal, or natural line of sight? A line drawn from the highest point of the base ring to the highest point on the swell of the muzzle. What is the Axis of a piece? The central line of the bore. What is the natural angle of sight? The angle which the natural line of sight makes with the axis of the piece. What is the dispart of a piece? The difference of the semi-diameter of the base-ring and the swell of the muzzle or muzzle-baud. The axis of the piece indefinitely prolonged. Does the line of sight and line of fire meet? Yes, the breech having a greater diameter than the muzzle, the line of sight is inclined on the line of fire. See Diagram 3. A B, axis of the piece; B E I F, trajectory; CF, line of metal; C D A, angle of sight, or dispart. The ball being thrown in the direction of the axis, A B, is acted upon by a force of gravity; and begins to fall at once below that line at the rate of 161/2 feet for one second, 641/8 for two, 144 3/4 for three, and so on in proportion to the time. It cuts the line of sight at E, at a short distance from the muzzle of the piece, and, descending again,; cuts it at the point F. This second point of intersection is called point-blank, and its distance from the muzzle point-blank range. As the natural j angle of sight, or dispart, is increased, the ball is thrown further above the line of sight, and the trajectory and point-blank distances become more extended. The distance from the muzzle of the piece to that point where the trajectory cuts the line of metal produced. How often does the Trajectory cut the natural line of sight, or line of metal? the “first point-blank,” and generally occurs at a distance of from four to eight yards from the muzzle, of the piece ; the second point of intersection is called the “natural point-blank,” when the line of sight is horizontal, and simply point-blank in all other cases. On what depends a Point Blank Range? On the charge, elevation, and windage. When the Point-Blank Range of a piece is required what should be specified? The angle of sight, charge of powder, and the kind and number of projectiles. When the enemy is beyond Point-Blank Range, how should the piece be pointed? By making the natural line of sight pass above the point to be attained. When the object to be struck is near, how should the piece be pointed? By directing the line of metal upon it when it is at point-blank distance, and below the object for all ranges less than point-blank. When should Grape and Canister be used in the Howitzer? When uncovered masses are the object of fire, and are not beyond a distance where the dispersion of grape renders it inefficient. When should Shrapnel be resorted to? When the object is beyond the effective play of canister. What is the design of a Shrapnel, or spherical case? To explode in front of exposed masses, and at such a height and distance as to disperse its balls amongst them. It is thus calculated to extend the advantages of canister beyond the reach of that projectile. Upon what conditions does the desired execution depend? Correct appreciation of the object’s distance, and timing the explosion at a proper distance above the same. When should Shell be substituted for Shrapnel? When the enemy is sheltered, and when material is the object of fire. When firing shell at troops, it should be prepared to burst over their heads; or, if the ground be favorable, to ricochet a little in front, and plunge into the column. When fired at material, it should explode after penetration. Should the fire of the pieces be carried on at the same uniform rate? required in pointing the piece: the fire increases in rapidity as the enemy advances. When should the fire of Artillery be slowly deliberate? At distances greater than 700 yards, in order that it may be executed with certainty. When should the fire be quickly deliberate? At any distance within effective canister range. What is the effective range of Canister? From 200 to 350 yards. When should the fire cease? When the projectile reaches the object by successive bounds. Is a projectile much retarded in ricochet firing? In ricocheting, is the projectile entirely submerged? No ; if sunk two-thirds of its diameter it will not ricochet. How should a piece be pointed to obtain ricochets? So that the line of fire is nearly horizontal. What is the greatest angle of projection in which ricochets can he obtained? 4° or 5° upon water, and not greater than 9° upon land. What are the favorable circumstances for ricochet firing on water? When the sea is smooth, and when not too near the enemy. What is the object of ricochet firing on land? To enfilade a face of the enemy’s work. To harass an enemy when formed, or in the act of forming, behind a rising ground, or other obstacle; taking post in a wood, etc. ; and in enfilading a line of troops. What are the peculiar advantages of ricochet firing? In being able to reach objects which can not be reached by direct fire, on account of intervening obstacles. Is it necessary that the distance should be known in ricochet firing? Define the term “Espace Battu,” or Dangerous Space. The space or distance over which a bullet, in approaching the termination of its flight through the air, passes within a certain distance from the ground, that distance being the height of either an infantry or cavalry soldier. What is the average number of shot which is effective in action? Not more than one in fifty. What forces act on the projectile in its flight? The impulsive force of the powder, the resistance of the air, and gravity, which causes it to descend. The speed or rate at which a body moves. If a projectile has a velocity of 1,500 feet per second, is- it meant that it actually passes through 1,500 feet per second? No ; but that at a given instant it moves at a rate which, if continued, would produce that result. The velocity decreases as the distance increases, in proportion a little higher than the squares of the velocities throughout. The rate per second at which a projectile moves at the beginning of its flight, immediately on leaving the muzzle of a gun, or as near the muzzle as the velocity can be ascertained. What is the remaining velocity? The rate at which a projectile moves at any specified point in its flight, after having experienced the retarding force of the atmosphere. What Is the striking velocity? That with which the projectile strikes an object. The quantity of motion. Momentum expresses the force with which one body in motion will strike against another. How is the Momentum of a body calculated? It is estimated by multiplying its mass, or quantity of matter, by its velocity. The reaction of the charge upon the bottom of the the bore; for instance, the charge of powder is reacted upon by the shot, and this reaction of the shot upon the powder is conveyed through the medium of that fluid to the gun, causing the gun to recoil from the shot with a momentum nearly equal to that which the shot has received. How is the recoil of the Howitzer checked when mounted on the Boat-Carriage? By means of the compressors. How is the recoil of the Howitzer checked when mounted on a Field-Carriage? Take out the axle or pin of the trail-wheel, and turn the wheel up on the trail. What proportion does the velocity of the recoil of a piece bear to that of the Ball? Inversely, as their weights or masses. Has the recoil any effect upon the flight of the projectile? No appreciable effect; the shot being expelled from the piece before it has recoiled a fraction of an inch. What are the inconveniences of recoil? The necessity of running up the piece after every discharge, and consequent fatigue to the men, and loss of time. What is the velocity of sound in the air? At 33° the mean velocity is 1,100 feet in a second. It is increased or diminished half a foot for each degree of temperature above or below 33°. How can the distance of an object be ascertained by the report of Fire-Arms? By observing the number of seconds that elapse between the flash and the report of the gun. Multiply the number by the velocity of sound in the air. How is Artillery rendered unserviceable? By driving a steel spike or file into the vent, and by clinching it by means of the rammer. By wedging the projectile into the bore, wrapping it with felt. By overcharging the piece, or causing shells to burst in the bore. How to unspike a gun. If a brass gun, unscrew the vent-piece ; if an iron one, drill it out. You can also unscrew the vent piece, wedge the shot forward, pour in powder, and fire the piece, after screwing in the vent-piece. There are many other ways of un spiking guns, and the good judgment of officers must suggest them. What are the causes of internal injury to Pieces? The action of the elastic fluids developed in the combustion of the powder and the action of the shot in passing out of the bore. Name the injuries of the first kind? Enlargement of the bore, corrosion of metal, cracks and cavities by the melting of the metal. Name those of the second kind? Lodgment of the shot—compression of metal on the lower side of the bore, at the seat of the shot, which is caused by the pressure of the gas in escaping over the top of the shot. The motion of the shot produces, generally, three other enlargements: the first, on the upper side, a little in advance of the trunnions ; the second, on the lower side, about the astragal; the third, in the upper part of the muzzle. Enlargement of the muzzle by the striking of the shot; external cracks, etc. When is a Piece said to be honey-combed? When the surface of the bore is affected by small cavities. To what is this due? more fusible than copper, and therefore melts more easily. Do Lodgments cause an inaccuracy of fire? Yes, by the use of wads over the cartridge; it changes the position of the shot. A less windage is also a remedy. What is a Rifle Piece? A piece whose bore is grooved for the purpose of giving a rotary motion to the projectile. Is any advantage gained by rotation? Yes, the range is increased, as the projectile offers a less resistance to the atmosphere passing through it in the direction of its least resistance, and corrects the cause of deviation by distributing it uniformly around the line of flight. Why does a Rifle Gun, throwing, a projectile of the same weight as a Smooth-Bored Gun, require less charge, and obtain greater range? Because there is no windage to the rifle gun, and, as before stated, offers less resistance to the atmosphere. Is the velocity of the Rifle Projectile as great as that of the smooth-bore? velocity; but the rifle projectile has the greatest range, owing to less resistance of the atmosphere, it is less retarded in its flight than the smooth-bore projectile, and gradually attains a greater range. What are the ingredients in Gunpowder? 76 or 75 parts of saltpeter, 14 or 15 parts of charcoal, and 10 parts of sulphur. Upon what does the good quality of Powder principally depend? On the purity of the materials composing it, on their intimate mixture, and proper proportions. What are the effects of increasing the proportion of Nitre? The powder becomes quicker, and better fitted for sporting. What the effect of increasing the Charcoal? The powder becomes “stronger, but will not keep so well, as charcoal absorbs moisture rapidly. What are the effects of Sulfur in Powder? It unites the materials, protects them from moisture, gives to the grains the requisite firmness for transportation, and adds intensity to the flame. What are the effects of glazing Powder? vents the grains from crumbling in transportation; in large charges permits a freer circulation of the flame, and is more rapidly consumed, although the inflammability of each individual grain becomes less. Does the size of the grains of Powder influence its effects? Yes; large-grained powder is used for cannon; small-grained for porterative arms. What are the advantages of graining Powder? A freer circulation of the flame; the powder does not sift through the cartridge bags, or between the barrel staves; it does not absorb moisture as readily as an ungrained mixture. Which burns the quickest, the small or large grain Powder? The combustion is more rapid the smaller the grain, and the bursting force of the powder is greater. What is the difference between the ignition and combustion of large and small-grained Powder? With large-grained, the ignition is more rapid, but the combustion slower; with small-grained the contrary is the case. Why should the grains be angular? Because they present a greater surface to the action of the flame, and therefore burn quicker. commences to move before the whole charge is ignited. What is the combustible ingredient of Powder? What is the use of Saltpetre? It supplies the oxygen necessary to support a rapid combustion, and to change the whole mass into gas. By what signs will the Gunner recognize the quality of the Powder? The grains should be angular, dry, and equal; difficult to be mashed by pressure of the finger, and should not leave any dust when rolled over the hand. What is the expansive velocity and pressure of ignited powder? Expansive velocity 5,000 feet per second; pressure about 2,000 atmospheres. What are the charges of Powder used in the different Howitzers? 24-pounder, 2 lbs. ; medium 12-pounder, 1 lb. ; light 12-pounder, 10 ouncess. What projectiles are used in the Howitzer? Shell, shrapnel (or spherical-case), and canister. To what projectile does the Howitzer owe its distinctive character? A hollow shot, which contains a charge designed to explode at specified times. How are these explosions produced? By means of a fuze. A tin cylinder attached to a sabot, and filled with shot. A piece of wood strapped to the shell, or shrapnel, on the side opposite to the fuze hole, and is intended to preserve the shell in its proper position in the gun. It is a hollow shot which contains a charge of balls and powder; it combines the advantages of the shell and canister. From whom does it derive its name? An English officer, Colonel Henry Shrapnel, the inventor. What is the weight of a 24-Pounder Shell? What is the weight of a 12-Pounder-Shell? What is the weight of a 24-Pounder Shrapnell? What is the weight of a 12-Pounder Shrapnell? What precautions are necessary to be used previous to loading Shell or Shrapnell? They are cleaned inside and out, gauged and examined, to see that they have no defects that would cause their rejection, that the fuze hole is not defaced; if there be water in the cavity, the shell or shrapnell is dried by a gentle heat, and cooled slowly. How do you gauge a Shell? With a large and small gauge; the shell must pass in every direction through the large and not at all through the small one. How do you load a Shell? The shell is properly cleaned and dryed; tapped to receive a fuze plug and a fuze and attached to the sabot. Fill the measure with powder, and pour it into the shell through a funnel; the throat of the shell is lacquered or white-leaded, and the plug and fuze secured in. What is the charge of a 24-Pounder Shell? What is the charge of a 12-Pounder Shell? How is the Shrapnel charged? The shot is cleaned, inspected, and the fuse hole tapped, to receive the fuze, the small hole is tapped to receive a plug; cover the lead balls with linseedoil, and put as many of them as may be possible into • the shell; warm the shell gently, screw the neck of a.
funnel into the fuze hole; push through the balls until it rests on the bottom opposite to the fuze hole, a mandril grooved on both sides; pour in melted sulphur, which enters the case through the grooves along the sides of the mandril, and when the sulphur is cool, the mandril is withdrawn, thus making a chamber for the charge. Lacquer the shot and strap it; fill the chamber with powder, ramming it with a wooden drift and light mallet; put a little lacquer or white lead on the threads of the screws; secure in the plug and fuze. Spherical-case are now usually loaded by putting in the bullets and pouring melted sulphur in until the case is full. After the sulphur has cooled, the space for the powder is bored out by a cutter, which removes both the sulphur and portions of bullets from the space. This gives a more compact projectile. What is the charge of a 24-Pounder Shrapnel? What is the charge of a 12-Pounder Shrapnel? Four and a half ounces. A contrivance by which fire is communicated to the bursting charge of a shell. How many classes of Fuzes are there? Three; the common time fuze, the concussion fuze, and the percussion fuze. What is a Time Fuze? An inflammable composition, which is ignited by the charge of the gun, and after burning a certain space of time, communicates the ignition to the bursting charge of the shell. What is a Concussion Fuze? An inflammable arrangement which is ignited by the charge of the gun, and which communicates the flame to the bursting charge of the shell, only at the moment of striking the object. What is a Percussion Fuze? A fuze which does not receive the flame from the charge of the gun, but causes an explosion by means of fulminates, at the moment of impact. What kind of Fuzes are used for the Howitzer Projectiles? The Borman, the paper-cased fuzes, Slid metallic fuzes. and 3, 4, 5, follow in succession, so that in cutting the graduation in five seconds, nearly the whole charge of the fuze will be burned before reaching the fuze magazine. 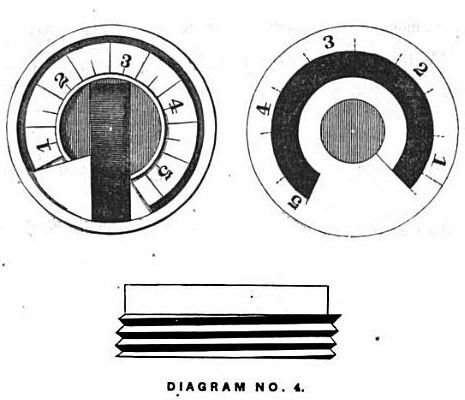 By severing at 4 seconds, a less distance will be traversed before ignition, and at 3, 2, and 1, the distance traversed by the ignition would be less in in proportion as the numbers near the magazine. How is the Borman Fuze cut? To the right of the figure denoting the time required, removing only enough of the metal to expose the composition. They are in form of a paper column, marked by black bands, indicating the appropriate number of seconds, and are packed together in water-proof paper; they are marked for 1, 2, 3, 4, and 5, seconds, according to the number of black bands. How many Fuzes are allowed to a Shrapnell? Five, giving time of 1, 2, 3, 4, 5, seconds. How are the Paper-cased Fuzes used? Shrapnell, and, just previous to loading the Howitzer, a fuze is placed in the case which is suitable to the time supposed to be required. How should an ordinary Fuze be cut to make it coincide with the Time required? Cut the lower ends of 3, 4, and 5, or the upper ends of 1 and 2 seconds. Why is the upper end of 1 and 2 seconds cut? Because they are bored at the lower end to their. assigned duration, which would not be altered unless the incision is made above the cavity. Mention one important advantage of the Borman Fuze. The shells can be loaded ready for use, and remain so any length of time, perfectly safe from explosion, as the fuze can be screwed into its place, and the com* position never exposed to external fire until the metal is cut through, which is done by gouging through the metal at the proper point, with a sharp instrument. How are the Charges of the Howitzer prepared? The cartridge-bag has two apertures; fill the bag with the charge of powder required, and close the inner aperture by tying it with a piece of twine, then rest the sabot of the projectile on the charge, and bring the outside aperture of the bag around the groove of the sabot, and secure it by a piece of twine. How is the Ammunition stored for delivery on board Ship? In boxes, containing nine or eighteen charges each; the boxes are marked with size and weight of the piece, and the charge of the cartridge; the cartridge is stored in the box next its bottom, and the sabot of the projectile rests on slats to prevent its weight resting on the cartridge. What is the amount of Ammunition delivered on board Ship for each Piece? 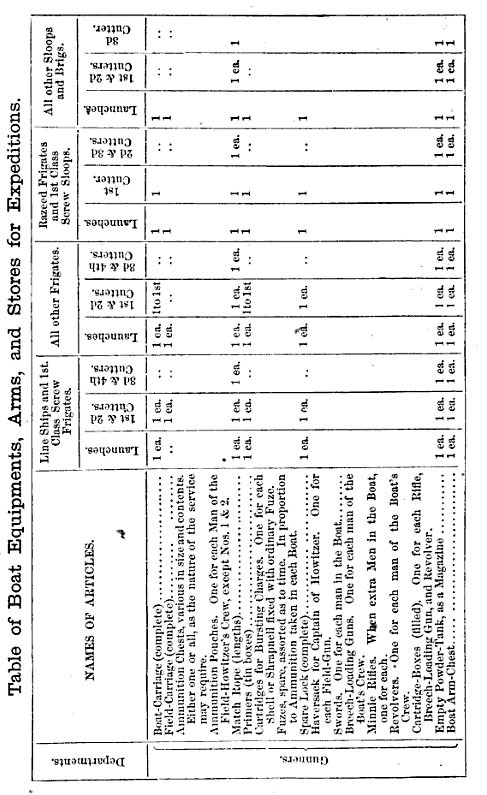 11 boxes ; containing 9 charges, as follows : 54 shrapnel, ^canister, 18 shells. What are the necessary precautions taken when embarking Ammunition? All lights and fires are extinguished, the red flag is hoisted on board ship as a signal announcing that powder is being taken on board. The boat carrying the ammunition must likewise have the red flag hoisted. What are Primers and their use? They are the means by which the explosion of the charge takes place. The ordinary primer is a quill tube, filled with fine powder, and capped with an explosive wafer. Explain the manner of Hoisting out Boats on board Ships. All hands out boats! when all hands are on deck. Lower away together! When the boat is in the water overhaul and unhook yard and stay tackles, and round up. Lay down from aloft! In a seaway, or when a vessel has headway, have a rope from the bows of the boat to fore channels, also one from stern to main channels. Stay tackles consist of two pendants, having a thimble and hook at one end, and a thimble at the other. The pendants are connected by a span, having a thimble at each end, through which the pendants lead. To the thimbles of the pendants are hooked the double blocks of the purchase. The purchase consists of a double and single block. The single block is hooked to an iron ring, having a stout hook attached to it. Yard tackles consist of long pendants with thimbles and hooks at one end, and thimbles at the other. The pendants have lizards, a short rope spliced arour.d the thimble, through which the pendant reeves. The pendant is secured to the yard-arm by the lizards. To the lower thimble of pendant hook double block of the purchase, and the single block to the same hook to which the stay tackle is hooked, and “mouse” the hooks. How do you prepare the Boat previous to hoisting it out? The coxswain will have the thwarts, oars, masts, and sails ready; lay the thwarts and traverses, and bolt the pivot-plates on the bows and quarters. Should the stern and stem pivot-plates interfere witli the purchase, they can be bolted on when the boat is in the water; the wheel and trail-tracks must also be laid and bolted. While the preparations are being made, the officer of the boat will see that the various equipments of the Howitzer are at hand and ready; the officer of the piece will attend to the piece itself and the carriage. The quarter gunner sees that the ammunition, lock, sight, sponges, spare fuzes, pouches, primers, muzzle-block, salvagee for cascable, spar for shifting gun, and drag-rope are at hand. The traverses, trucks, and pivot-plates are attended to by the captain of the gun. Hoisting out Howitzers and stowing Implements. How is the Howitzer struck into the Boat? The Howitzer should be so adjusted as to hang square and its compressors tightly set; pass a stout strap through the loop-lugs, bring it up around the piece and hook the purchase to it. Is this manner of striking out the Howitzer advisable in a heavy Sea? In a seaway it is advisable to place the Howitzer in the launch athwart ships, bolting the two ends of the slide into the bow pivot-plates. Where and how is a Field-carriage stowed when the Piece is mounted on the Boat-carriage? If the Howitzer is in the bows, the field-carriage is placed aft, the wheels resting on the floor of the stern sheets, the trail laid over the quarter-rail, clear of the helm. If it is in the stern, the field-carriage will be placed in the bows. Where is the Ammunition stowed in the Boat? On the side opposite the Howitzer: if the Howitzer is in the bows the ammunition will be stored in the stern, and vice versa. How are the Boats provided for when on Service? How is the Launch’s Crew armed for Service? The launch’s crew reserved for the piece are armed with cutlasses and pistols, and those reserved for boat duty armed with carbines or rifles. Explain by Diagram the Stations of the Crew in a Boat. Explain the Arming and Equipping Boats for service. Nos. 1, 2 and 8 drop the boat alongside, place the traverse and pivot-plates and prepare for receiving the piece. No. 3 provides rammer, sponge, pivot-plates, bolts, shifting spar, ladle, trail, handspike and salvage-strap. Nos. 4 and 10 provide spare articles for howitzer traverses and skids. Nos. 5 and 6—All the ammunition. “ 7 —Pouches and haversack. “—Curtains, pistols, belts and hatchets. “ 11 and 12—Rifles complete and tarpaulins. “ 13, 14, 15, 16 and 17—Provisions and cooking utensils. Nos. 18, 19, 20 and Coxswain—All the spars and boat gear. Quarter Gunner—All spare articles for piece. What are the Duties of Officers of the Boats previous to fitting out for an Expedition? The officer of the boat sees that the boat is properly provided for ;. the officer of the piece attends to the howitzer and the quarter gunner to the ammunition. The boat’s crew should be properly drilled. Who are considered the Guides of the Boat’s Crew in exercising Boats by Oars? The two stroke oarsmen, as it is by them the other oarsmen are directed when dipping, raising, laying on, and tossing oars, etc. By what Rule is the Crew to be governed in Propelling the Boat? By the simultaneous motion of the oars, that the entire force may be exerted at once and avoid checking each other in their movements. Explain the manner of Training Boat’s Crews. When a boat is about to leave the ship, the bow and stroke oarsmen on the side nearest to the vessel stand up, holding the boat by means of the boat-hook. If the oars are not trailed, the balance of the crew, excepting the Coxswain, will “peak” their oars and await commands. Lay on your oars! The oars are squared with the flat side of the blade turned to the water’s surface, so as to prevent the action of the wind thereon, and thus keep the boat almost stationary. Way enough! The oars are tossed or trailed, and the stroke oarsman on the side nearest the vessel takes his boat-hook, ready to use it as required. How are the Boat’s Crew armed for an Expedition? The crews of boats destined to man and work the Howitzer as has been stated, are armed with cutlasses and pistols, and, at times, with light small arms which. when not to be used, are slung over the shoulder ; all other boats’ crews are armed with carbines or rifles; the crews are formed into infantry companies; a few men are destined as boat-keepers, and form a reserve force to protect the boats. Forming of the Boats for Service. How are the Boats of a Ship formed when about shoving off for Service? No. 1—1st launch; senior officer. 2—2nd launch; officer next in command. In less than six boats they will fall in according to their size and designation. Exercise of Boats by Division. What is meant by division of Boats? The boats of the ships of a squadron when acting in concert. What is a Sub-division of Boats? The boats of each ship constitute a sub-division. Explain the first Order, or Order of Columns. To form in the first Order. To pass from either order of attack, just mentioned, to the first order, the maneuvering is to be the inverse of that by which the order of attack is formed. The orders of attack being formed as designated, it is sufficient for all the boats together to alter the course eight points, one way or the other, to become arranged in a line ahead, in two or three columns. Being thus arranged in a line ahead, by turning back eight points the boats will be again arranged in an order of attack, two or three deep. To change the direction of the Front. 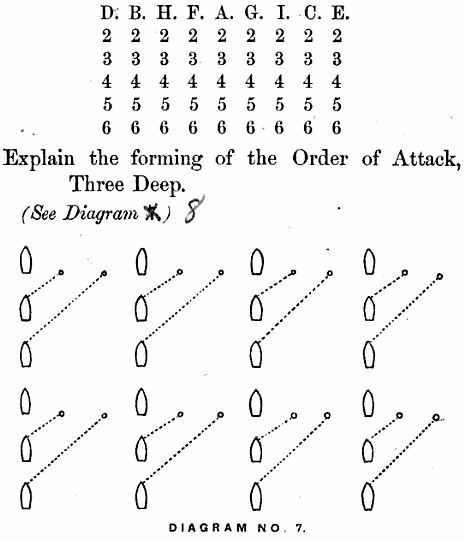 The evolution of changing the direction of the front of the orders of attack is effected by a general movement at the time the course, which the leaders of columns are to steer, is shown by signal. To form the Order of Retreat. This order is the reverse of the first order. To pass from the first order to the order of retreat, all the boats turn together sixteen points in the same way, and thus retire, protected by the guns of the launches. Two or three divisions of attack may be formed to operate upon two or three points at the same time. In the first case, the boats on the right, including those of the commanding officer, constitute the first division, and.those on the left the second. In the second case, the third of the boats on the left constitute the 2d division; the third on the right the 3d division; and the third at the centre the 1st division. boats when ranged in the first order; this will give three boats’ lengths for the interval between them when formed three deep, and two when formed two deep. The distance between the lines may be one boat’s length when ranged in the first order, which will give three when formed three deep, and five when formed two deep. The boats having the 24-pounder howitzers should be so placed on the flanks of the line as to secure a cross fire on the enemy’s position, and on all the ground over which he moves, to oppose a landing. The lighter pieces are distributed along the first line. The rear line consists of boats containing the small-arm men, men of the same company being near each other. The howitzers Should land alternately, or the landing of two thirds of the howitzers could be covered with the remaining third. When the landing of the howitzers commences, the second line of boats pull in and land . on the right of their leaders. When under fire, the quicker the landing the better. Before the commencement of an action, the pieces should be as much as possible under cover, by taking advantage of banks, hollow-ways, buildings, woods, &c; they should be masked as much as possible, until ordered to open fire. As soon as the men are landed they are formed, under shelter, if possible, and the skirmishers are thrown forward. Howitzer Stations, and Exercises in Boats. How many Men are required to Serve a Boat Howitzer? Generally a warrant officer, called the officer of the piece. He commands, unless otherwise ordered by the officer of the boat. What are the Commands when exercising the Boat Howitzer? (Preliminary order) Man the Howitzer! 5th. Pivot on the Port (or the Starboard) Bow! At this order, 2, 3, 4, 5, 6, and 7, will trail their oars and repair to the stations as per diagram 9. 2 places the vent-cloth on the vent, pressing it down with his hand; 3 handles the sponge, palm of the right hand down, left hand up, and inserts it into the bore, presses it to the bottom, turns, withdraws and reverses it for ramming. The quarter-gunner presents a round of ammunition to the officer of the boat, who adjusts or cuts the fuze as required. 4 receives it with both hands, the shell in the left, cartridge in right, inserts it into the muzzle, so that the part of the fuze which is cut will be uppermost. 3, keeping his body clear of the muzzle, sends the charge gently home to the mark on the rod, withdraws it, takes his station and keeps the sponge in a vertical position. 2, when 3 is clear of the muzzle, will unserve the vent, and insert the primer, which he covers with his hand until the piece is out. 5 and 6 ease up the compressors; the piece is run out, and 5 and 6 tighten the compressors. The officer of the piece adjusts the sight-bar by direction of the officer of the boat; 7 trains the piece; 2 attends the elevator. Ready—Fire! The captain of the gun watches the movements, and as soon as the sights coincide with the object, gives a firm pull of the lock-string. just before the sights coincide with the object. After firing the piece, the captain clears the vent with the vent-bit, to remove the fragments of the quill which may remain; if the cap explodes without firing the piece, the captain will wait a reasonable time before again approaching it. Pivot on the Port (or Starboard) Bow! 7, with the assistant, trains the rear end of the slide into the bow pivot plate, which is not to be used, and bolts it in; 3 draws the bolt of the stem-pivot, and, with an assistant, draws around the forward end of the slide into the pivot-plate, to be used, and drops in the bolt; 7 withdraws the after-bolt. Transport the Howitzer! 7 trains and bolts the rear of the slide to the bow-pivot plate. 3 withdraws the forward pivot-bolt, and, assisted by the crew, shoves the muzzle of the piece around. 7 takes out the after-bolt, and points the piece aft. The Howitzer is then raised on rollers, placed on the field-piece tracks and pushed aft; check-guys may be used to keep it properly pointed, and to prevent it from falling over. It will be necessary to trail the oars. When the Howitzer is Pivoted on the Bow, is it prudent to Train it Abaft the Beam? It is not advisable to train it more than a point abaft the beam, as an explosion would be dangerous to the crew. What are the Implements required for shifting Howitzer from Boat to Field-Carriage? A muzzle-block, a salvagee-strap, a shifting-spar, and a small iron or wooden bolt, which will enter the breeching-hole to keep the piece on the right slew. How is the Howitzer’s Crew equipped for Land Service? Besides the arms, each man, excepting 1 and 3, carries a pouch containing one round of ammunition, and a set of common fuzes, slung over the right shoulder. 1 carries a haversack containing a supply of primers, spare fuzes, spare lock, vent-bit, vent-cloth, and implements for spiking, and a tourniquet. When landing, the straps of the pouches and haversacks are shortened to keep them clear the water. 2 puts on his primer-box, and beckets a priming wire to his right wrist. How are the Implements and Ammunition of the Howitzer carried in active Land Service? the axletree. If necessary, extra ammunition may be slung under the piece. What is the Length of the Drag-Rope? For the medium 12-pounder, about 20 feet; for the light 12-pounder, about 22 feet, in order that the distance from the face of the muzzle to the leaders of the drag-rope may be the same from both guns. What are the commands for Disembarking the Howitzer? The quarter-gunner provides the the pouches and haversack for the Howitzer’s crew. 2, 3 and stroke-oarsmen will trail oars. 2 and 3 will adjust the bed of the piece to the place on the slide for shifting, ship the muzzle-block, and by means of the elevator cause the muzzle to bear on it; they will also pass a strap around the neck of the cascable, and put the shifting-spar through it. The quarter-gunner, assisted by the stroke-oarsmen, will raise the field-carriage upon the tracks. 2. Trail! The oars are trailed, and, when the boat is beached, 4 and 5 step over the bows and adjust the skids, which are launched by 6 and 7. 8, 10, 11 and 12, attend the shifting spar. The stroke-oarsmen, with assistance, run the fieldpiece forward, the quarter-gunner guiding it on the track by the trail. 3. Shift the Howitzer! 1 and 2 clear the elevator. 8, 10, 11 and 12 man the shifting spar and raise the breech of the piece. 6 and 7 back the bed on the slide. The stroke-oarsmen and quarter-gunner will run the piece forward, so that the lugs come under the loop of the Howitzer. The piece is lowered. 9 puts in the loop-bolt, 2 the elevator. 6 hooks the drag-rope, and 7 ships the trail handspike in the socket. 4. Land! 2, 3, 6 and 7 jump out of the boat and assist 4 and 5 at the skids, standing outside of them. The stroke-oarsmen, with assistance, wheel the piece to the gunwhale by the spokes. The quarter-gunner guiding by the trail hand-spike, the Howitzer is eased down from the bow on the skids, so that the wheels may not run off. A few hands attend the drag-rope to check the piece as required. If the command to “man the drag-rope” is not immediately given on landing, the crew will fall in, two deep, in close order—the front rank composed of the odd numbered men, the rear rank of the even-numbered men, No. 1 being on the right of the front rank, No. 2 on the left of the rear rank. The chief of the piece stands two paces in front of the center of the crew, calls the roll and repairs to his place on the right of the front rank. The quarter-gunner takes post one pace in the rear of the centre of the crew. In Front!—[See Diagram 11.) The crew form in two ranks, with their center opposite to the trail, two yards distant, and face the piece. They are dressed by the chief of the piece who is on the right; the quarter-gunner is one pace in the rear of the center. In Rear! — (See Diagram 11.) The crew form in two ranks, with the center opposite to the piece, two yards distant, face the muzzle, and are dressed by the chief of the piece; the quarter-gunner is one pace in the rear of the center. On the Right! (or Left. )—( Diagram 11.) The crew form in two ranks, as before, opposite to and a yard distant from the axle-tree. CHANGE OF POSITION OF THE CREW. 1. Crew to your Stations! The front rank faces to the right, rear rank to the left, file to the right and left, halt as they reach their stations, and face to the front, (which is towards the muzzle,) covering numbers 3 and 4. The chief of the piece and quarter-gunner take their posts as before indicated. 1. Crew to the Front! The men front of 8 and 9 face about, and at the second command file off to their posts, numbers 11 and 12 passing numbers 9 and 10, who follow them, and who are followed in succession by 7, 5, 3 and 1 of the front rank, and 8, 6, 4 and two of the rear rank. The chief of piece and quarter-gunner take their positions as previously prescribed. 1. Crew to the Rear! The front rank faces to the right, the rear rank to the left, file to their prescribed posts, the ranks passing on their respective sides of the piece. The front rank face to the left, the rear rank to the right, and file off to their respective stations, as per diagram 12. 1 and 2 step to the front of 3 and 4, and at the word march, the crew file to the rear • the chief of the piece and quarter-gunner take their respective posts as before described. The front rank face to the left, the rear rank to the right; at the word march, file to the front, each rank marching on their respective sides of the piece. The men face in the required direction, at the word march, repair to their posts, countermarching when necessary. March! 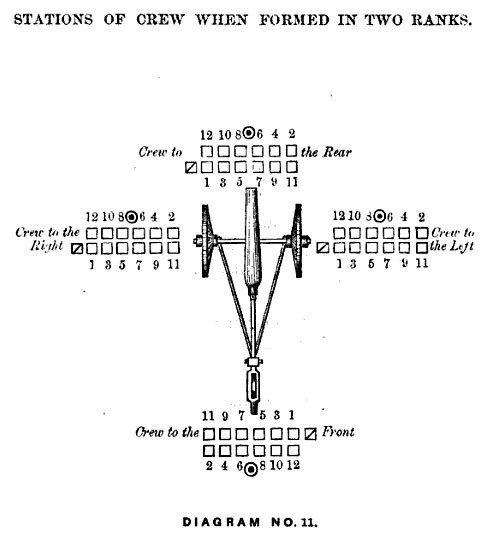 If the accidents of the ground require it, 4 and 3 will seize the spokes of the wheel on their respective sides, and shove forward ; the quarter-gunner will assist by pushing on the muzzle, the balance of the crew, acting together, will haul on the drag-rode. As soon as the piece is fairly in motion, 4,3 and quarter-gunner will resume their stations. To Support in Retreat! Nos. 3 and 4, or 3, 4, 5 and 6, on their respective sides, hold back on the check-ropes and wheels. 1 and 2 raise the trail and carry it around to the right; 3 and 4 seize the wheel next to them ; the right wheel is turned forward, the left back; the piece is carried about with the muzzle to the front, and the trail is lowered. If required, 5 and 6 can assist at the wheels on their respective sides. The piece is placed in the required direction by 1, 2, 5, 6, 7 and 8. 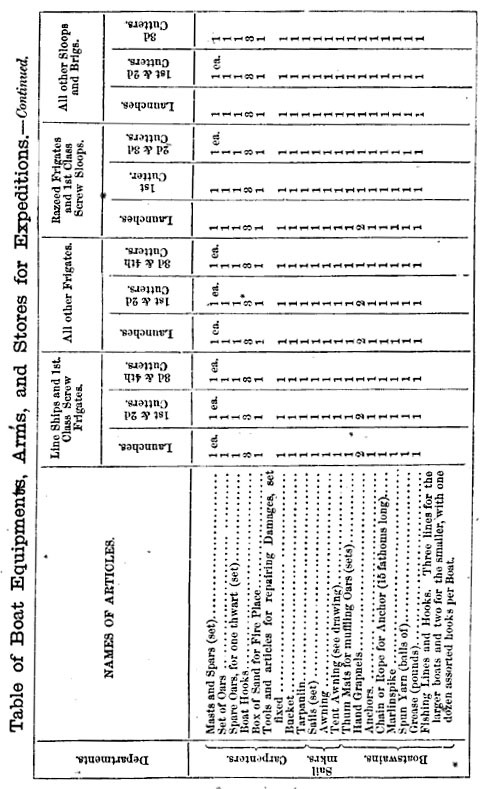 Stations for the service of the Piece.—1, rear of the breech to the right; .2, rear of the breech to the left; 3, right side, rather at rear of the muzzle; 4, left side, rather at rear of the muzzle; 5, rear and outside of right wheel; 6, rear and outside of left wheel; 7, rear of 1; 8, five yards rear of left wheel; 9, five yards rear of right wheel; 10, rear of 8. Supernumerary.—11, abreast on the right of the ammunition. Supernumerary.—12,. abreast on left of the ammunition. Quarter-gunner and the ammunition 25 yards in rear of the piece. The chief of the piece stands opposite to the middle of the trail hand-spike, outside, and near the crew on the left; all face to the front, which, with the piece in action, is in the direction of the muzzle. When the piece is ready for marching, the front is towards the trail. In the event of accident, the vacancies will be filled by the higher numbers. Each piece is commanded by a lieutenant, when acting singly; when there are several pieces,’a lieutenant commands a section, which consists of two pieces. The officer in charge of a section is called chief of a section. TO SPONGE AND LOAD BY DETAIL. Command, Sponge! 3 obliques to the right, then to the left, and brings his person just opposite to the muzzle, half-way between the piece and the wheel; he holds the sponge-head inward, handle horizontal, palm of the right hand down, left hand up, and carries the right foot, with bended knee, 30 inches to the right, raises both hands until the handle is level with the bore of the piece, and slips the left hand up to the sponge-head ready to enter it. 4 obliques to the left, then to the right, and takes his station abreast the muzzle, half way between it and the wheel. 2 clears the vent with the primer-wire, and serves it with the vent-cloth. 3 inserts the sponge, presses it to the bottom of the bore, turns, withdraws, and reverses it for ramming. A damp sponge is preferable. The quarter-gunner cuts or adjusts the fuze, as directed by the chief of piece or captain. Load! 4 takes the shell in the left hand, cartridge in the right, inserts them into the muzzle with the cut part of the fuze up, and withdraws to his station outside of wheel, in rear of the muzzle, and receives another charge from & The charges are transmitted to 4 by the men on the left of the piece, excepting 2. [[* The French way of executing this command is advisable: No. 4 (as above stated) inserts the load and repairs to the ammunition-chest for another charge. then assumes the best position for observing the effect of the fire. In quick firing the captain can point whilst loading. after firing, the piece, if required, is wheeled into its former position by 5, 6, 8, and 9. 7 lays back the hammer, and coils the lock-string loosely over it. 2 clears the vent of fragments of the quill. 2. TO LOAD AND FIRE WITHOUT DETAIL. The chief of the piece commands Load! which the captain of the gun repeats. The duties are executed without further directions. The captain takes position to the right or left to observe the effect of the fire. When ready, the officer of the piece commands, Fire! 3. TO LOAD AND FIRE IN ACTION. The chief of the piece commands: Load! the captain of the piece repeats. The piece is sponged and loaded. At the proper moment the officer of the piece commands, Commence Firing! The captain commands, Ready—Fire! As soon as the piece is fired, the men step into their places and reload it without further orders, except as to the elevation by the captain. The piece should be run up to its place after each discharge, if thought necessary by its chief. When the gun is reloaded, the captain commands as before, Ready—Fire! Firing! before Load! the captain commands, Load! and afterwards, Ready—Fire! To suspend firing, the chief of the piece commands, Cease Firing! Unless an order to the contrary is given, the piece, if loaded, should be discharged, or the charge withdrawn. The implements are placed in their proper places, and secured by the same men who removed them when going into action. 4. CHANGE OP PARTS AND STATIONS TO FAMILIARIZING THE CREW WITH THEIR DUTIES. The chief of the piece commands, Change Stations! At which the men remove their equipments and lay them at their feet. March! The men will march from the left of the gun to the right of the piece; for instance, 4 taking the place of 3, who takes the place of 5; 6 takes the place of 4, &c.
Batteries, and their Proper Position in Action. How many Pieces are allotted to a Field-Battery? Six ; four pieces may be used as such. How should the Pieces be masked? By the companies of small-arm men. How should the Fire of a Piece be directed in the commencement of an Action? 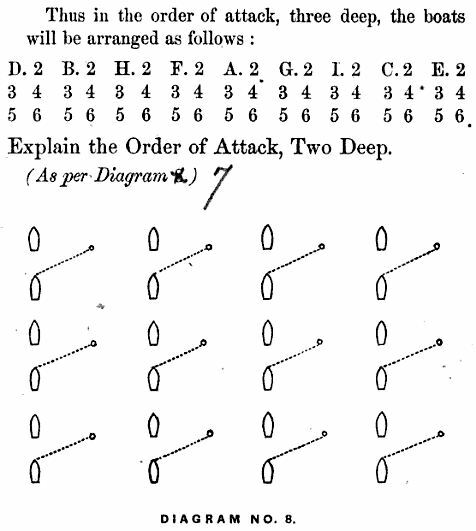 the real points of attack; but, when advancing in columns, the fire should be concentrated upon the real points of attack. How should the Batteries be Placed in relation to Troops with which they, are acting? Upon the flanks of a line, at such a distance as not to impede its movements; the pieces thus represent the face of a bastion, and the line of troops the curtain. Is the Front of a line of Troops an advantageous Position for a Battery? No; it is the worst possible position, and offers a double object to an enemy’s fire, and obstructs the movement of troops. Is the Rear of a line of Troops an advantageous Position for a Battery? No; the position is nearly as bad as the front of the line. How are Batteries Disposed with regard to the Enemy’s Troops? So as to secure a cross-fire on his position, and on the ground over which he moves to the attack, endeavoring to take him at all times in the direction of his greatest dimensions; “obliquely or in flank, when in line, and in front when formed in columns. Is it necessary to confine the Batteries to the Flank? in the centre, if the flank batteries cannot sweep the whole front. The embarking is on the same principle as the landing; the flank boats keeping up a brisk fire; the centre pieces are the last to leave the shore. The boats, in retreating, shift the pieces aft, and send all the men possible to the oars. They will continue to fire. The light boats will retreat as quickly as possible. The ” School For The Battery” will soon be published.